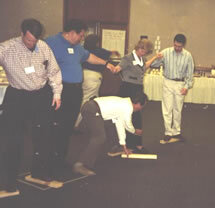 This website contains examples of the directions, facilitator notes and other information you will need to be able to successfully conduct your own powerful High Performance Team Building training. The complete directions, facilitator notes, and our Communications Styles Presentation can be licensed for a modest licensing fee payment of $99 US, . The High Performance Team Building experience consists of the sessions listed below. The approximate time to facilitate each session is indicated in parentheses. From this list you may click on the underlined sessions to view examples of the level of detail included in the facilitator notes. Industry trainers and consultants who are interested in developing high performance teams may license this material (including detailed directions and facilitator notes for the entire outline above, Communications Styles presentation, and participant handout) for a modest one-time license fee of $99 US. The Communications Styles Presentation is a highly entertaining and interactive color presentation that has delighted audiences over hundreds of sessions. 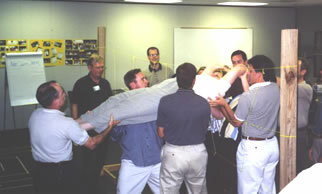 This presentation is an essential element of delivering effective high performance team building sessions. This is a well-proven, highly interactive presentation that is complete and ready to deliver. Successful delivery of this one and a half hour course is NOT dependent on the skill of the presenter. The presentation clearly and simply explains that each of us has one of four major communication styles: Director, Socializer, Relator, Thinker. Each of these can be further divided into four sub-styles for a total of 16 sub-styles. Communication styles telegraph how we like to give and receive information. The student learns that some communication styles naturally irritate those with other styles, but that each style is essential for the team to be successful. Students use an individual inventory to identify their own styles. They also learn how to identify the communication styles of others and techniques for presenting information so that it is more easily accepted by those with other styles. Most importantly, students come to understand that the full range of communication styles needs to be represented for the team to be successful. The philosophy is based on Tony Alessandra and Michael O�Conner�s 1996 book, �The Platinum Rule.� Those familiar with DISC or Meyers-Briggs will find similarities, although we believe this presentation is more easily understood and applied. It has proven to be suitable for audiences ranging from the executive suite to the loading dock and everyone in between. This is a four-color 38-foil presentation that is presented in MS PowerPoint. It is designed for use as an overhead foil presentation together with a 60-page student handout. Licensing the High Performance Team Building Training provides you and your corporation the right to use the detailed directions, facilitator notes, and Communications Styles Presentation (38 pages in Microsoft Powerpoint) and to duplicate the Communication Styles handout (60 pages in Microsoft Word) for distribution to your participants. In addition, you are entitled to contact the author by phone, 972 734-3387, with any questions or guidance you may need to successfully present this program. Copyright © 2000 PT Consulting Partners. All rights reserved.